Posted July 18th, 2012 by David Porter & filed under MailBigFile, Social. Are Newspapers Changing Fast Enough? It may be hard to believe, but the most visited English-language news source in the world is The Huffington Post. Not Wikipedia, The New York Times nor any other paper edition, but the internet-based HuffPo clocks up over 60 million unique hits a month. Started in 2005 by Greek export, Arianna Huffington, it is a unique mixture of serious takes on weighty news and light-hearted humour. It is funded from advertising and brings together original journalism and probing interviews with blogs and articles written by the great (unpaid) public. Another unique selling point is that it carries links to content on competitors’ sites. That was a puzzle to many at the outset, but nobody is laughing now as the business model clearly works. Nobody is laughing, except perhaps Arianna Huffington. Her creation was bought in 2011 by AOL for a cool $315m. Now she, still at the helm, is set to build on its local sites in Canada, Britain, Italy, Brazil and Turkey with new openings in Turkey and Greece and then, the biggest prize of all, China. Surprisingly or not, it’s in Britain that growth has been relatively modest. Many British readers remain loyal to the US original, but the bulk of British news readers tend to stick with Google or Yahoo or their own national newspapers. The British Huff Po is pulling in around 3.5 million monthly users and has clocked 100,000 comments since the start. Apparently, analysts had expected more. High powered woman that she is, Mrs Huffington told the Daily Telegraph (2 July 2012) that ‘it is very hard to be creative when you are constantly running your life from your inbox.’ She has learned to have regular naps and has installed ‘sleep rooms’ in the offices for staff. July sees the launch of a ‘GPS for the Soul’ app which /measures stress indicators such as a user’s heart rate and links directly to photographs, music or breathing exercises that can help people ‘back into a place of balance’. Sounds interesting if that’s your thing. The really interesting point is how journalism is moving to more interactive, holistic provisions of services. Inform, educate, advice/recommend, comment, make laugh, care about, share, publicise … it’s the new journalistic front. Tom Rosenstiel wrote in the Washington Post, April 2011, that if just five myths were laid to rest, the press will not become yesterday’s news. Myth Two says that online news will be fine as soon as ad revenue catches up. He said that web ad revenue surpasses print ad revenue by a large margin, but most of it goes to search engines. The advertising executives now have a wide range of media to use to hit customers. Myth Three, left over from the old days, says that content is king and will always be such. He felt that the key to 21st century media success may be who has the ‘most knowledge of audience behaviour, not who produces most popular content’. In other words, who has the data, controls the world. 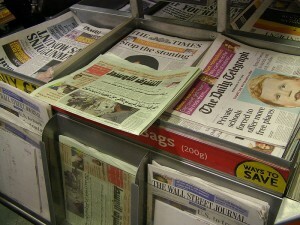 Myth Four says that globally, newspapers are on the decline. He pointed out that print circulation worldwide went up 5% in the previous five years, with print ad revenue up in some countries (India, Egypt, Lebanon) and down in others (France, Japan). He felt that growing literacy across much of the world would fuel the paper industry until their broadband caught up. Myth Five says that the solution is to focus on local news, or ‘hyper-local’. At least that was the buzzword a year or two ago. However, that approach has by necessity a limited appeal and reach. There is scope for local advertising, as Google is showing, but producing local content by itself wont make a profit. And that is still the bottom line, no myths about that. Is the Final Chapter of the Book Beginning? Do Magazines Have Both a Paper and a Web Future? The Washington Post, Tom Roseniel, Five myths about the future of journalism, 7 April 2011.